I grew up with Greek tastes and smells, savouring simple grills, crunchy greens, lemony stews, milky puddings and had cinnamon tickling my taste buds. When you grow up with something, you tend to cherish it. But when you visit a place how much can you really discover? I made a top 10 of some perhaps not too well-known Greek dishes. Well, for me food is a must experience in order to immerse yourself in a culture. Greek food is amongst the best of the Mediterranean diet. It might not share the splendour of Italian cuisine and it certainly lacks the finesse of French cuisine. What it does have though, is super healthy vegetable stews, some not so healthy fritters and wonderful syrupy desserts. All undeniably tasty. Personal favourites aside, I learned to appreciate Greek cuisine for its simplicity. You rarely need more than a couple of ingredients and a couple of herbs for seasoning. A simple meal can just be bread, a bit of cheese and olives. But ingredients have to be fresh and seasonal. You will not have tomatoes in winter or lettuce in summer, it’s guaranteed to taste bland. Pies, especially spinach pie. But beware every place tends to have a speciality so might be worth seeking out regional cheese pies or mince meat pies. Ntakos – perhaps the most famous salad of Cretan cuisine. On a base of barley rusk, we add juicy tomatoes and crumbled feta then sprinkle with oregano and olive oil. So simple and so tasty. 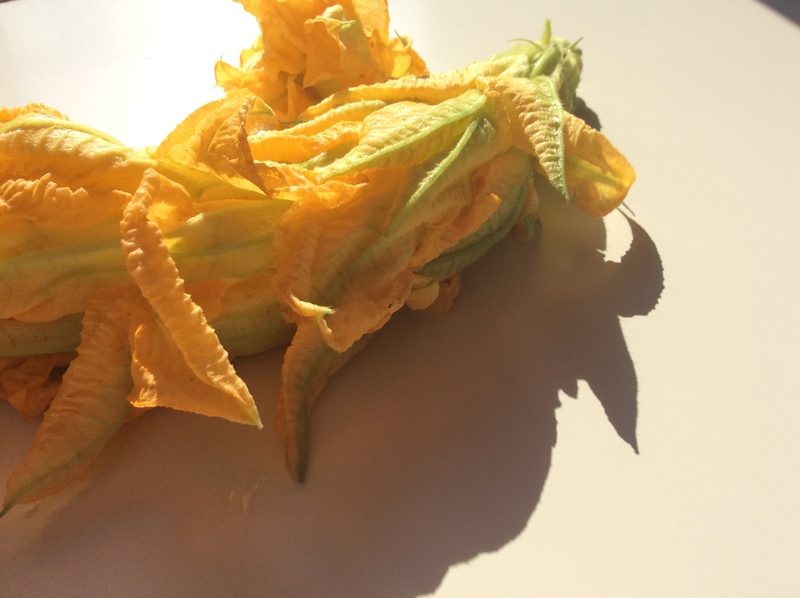 Courgette flowers, normally with rice, sometimes with beef mince too, either fried or baked they are a summer favourite. Dolmadakia, a tough to find very good ones that resemble grand-ma’s but they do exist! Try them in each tavern you visit. Yemista – stuffed vegetables, mainly tomatoes but also aubergines, peppers and courgettes. Simply delicious. Octopus on the grill. I know some might shriek at the thought of tentacles. It is a very smart creature after all. I am afraid, I am a well-known omnivore and I have to testify that I have a soft spot for the creature when offered on the grill with a bit of olive oil, vinegar and oregano. Grilled sea-bass or any fish that has come out of the boat, especially when on islands. We sprinkle our grilled fish with olive oil, lemon and oregano. You get to taste the best of the Med. Soutzoukakia, a Smyrnan favourite. Mince meat at its best, loaded with cinnamon, cloves and allspice. You will be mopping this sauce with bread. I can guarantee this. Horta, wild greens are offered boiled and it’s imperative to squeeze some lemon on top. I substitute my Greek horiatiki for these darlings, it’s seasonal and the greens change every season. Have you come by any Greek dishes you really savoured in your travels? I would love to hear about them. Let me know below in the comments. Bamies are so good when they are well prepared! And definitly one of my favourite: halloumi with some squeezed lemon on top. I am a big fan of all of all your Top 10 but the one that really has me licking lips is smoky chewy chargrilled octopus, if possible served with fava served with a lovely fresh roka and sundried tomato salad. Slurp! No sweets on the list! Galaktoboureko is one of my all time faves, along with syrupy semolina cake and baklava of course. I like the ethos of a few, fresh, and in season. It’s the way forward, just like before. I’m always meaning to try Courgette flowers, considering I grow them! I shall note your recipe. Thanks. Fresh and few, it always was the way, we should definitely cook more in this style! Courgette flowers are simply amasing, you are going to love them!